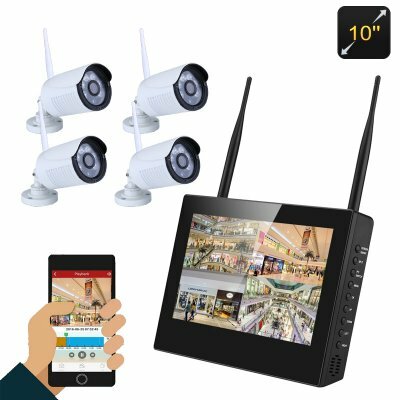 Successfully Added 4 Channel NVR Kit - Linux OS, 4x HD Camera, 10-Inch Display, Nightvision, WiFi Support, SATA Hard Disk, 4TB Storage Capacity to your Shopping Cart. Each of the four security cameras supports a 1280x960p resolution. Thanks to this, you’ll be treated to high-detail and sharp images at any time. They furthermore pack 6 IR lights that bring along 15m night vision capabilities. Whether it’s day or night, your property will always be fully protected. As this NRV system treats you with 4 IP cameras, it is the perfect security kit for home security and small offices. Whether you place them indoors or outside, these security cameras will capture any movement in the area.